"Seasonal Specialities", the theme for this week at I Heart Cooking Clubs (IHCC), where we are cooking any Jacques Pepin dish made with seasonal ingredients. Well, in Malaysia, we are blessed with tropical climate, most of our veggies comes from the highlands where the weather is very much cooler but sunny, which is ideal for growing veggies. We do not have the four seasons, so most of our produce are available the whole year round. Vegetables and most fruits, like pumpkin, zucchinis, tomatoes, cabbages, salad greens, mangoes, watermelon, pineapples, etc... are available the whole year! How lucky are we! So in line with this week's theme, I've chosen tomatoes (which is always in season! ), and some herbs from my garden pots. Simple, quick and easy dish to prepare. Onions and potatoes are sauteed in a some oil until brown. Arrange a layer of sliced tomatoes over the top, cover and cook for a minute. Break the eggs into a bowl, mix with the chopped herbs, and season with salt and pepper. Pour the egg mixture over the tomatoes, using a fork to gently stir so that the eggs flow between the tomatoes and potatoes. Cook for a minute or two, and place the skillet in the oven, using the top broiler, for a few minutes until the eggs are set. A mixture of fresh herbs from my potted garden ; cilantro, chives, Thai basil. Slide the omelet onto a plate and cut to wedges to serve. I made this for an afternoon lunch with some leftover salad from the day before. I like the onions which has caramelized, and would add on extra onions the next time. Lovely with the chopped fresh herbs, tomatoes and potatoes. Heat the oil and butter in an 8- to 10-inch nonstick skillet until hot but not smoking. Add the onions and potatoes and cook, covered, for about 10 minutes, stirring occasionally to brown on all sides. Add the tomato slices to the skillet, arranging them so they cover most of the potato and onion mixture. Cover and cook for 1 minute. Meanwhile, break the eggs into a bowl. Add the chives, salt, and pepper and mix with a fork. Preheat the broiler. Add the egg mixture to the skillet and stir gently with a fork for about 1 minute so the eggs flow between the potatoes and tomatoes. Slide the skillet under the broiler, 3 to 4 inches from the heat, and cook for about 3 minutes, until the eggs are set. Slide onto a platter, cut into wedges, and serve. Merhabalar, ne kadar iştah açıcı ve leziz görünüyor. Ellerinize sağlık. 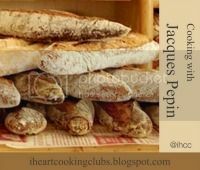 I love this recipe of Jacques Pepin!! are the herbs from your garden? Beautiful omelette Joyce !! I love omelette! Joyce, this omelette looks so good! I bet it is very tasty with all those fresh herbs from your garden! Oh this must be more filling than a regular omelette... great for hungry days! I love those herbs. The potato omelette must be very tasty. You are so lucky to have so many fruits and vegetables grown locally year round! This looks really delicious, Joyce. I love the combination of potatoes, onions and tomatoes! That looks so delicious Joyce! I love how you elevated the simple ingredients in this dish with those beautiful fresh herbs. I think if could eat this every day. Isn't it fun being able to harvest your own herbs for cooking and baking? Lovely dish with so many great ingredients to work with, especially the perfect home-grown herbs.